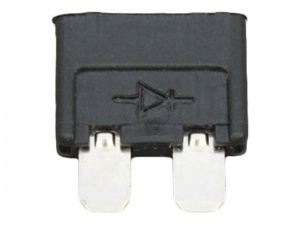 Diode in standard blade fuse form. Can be used to protect sensitive circuit components from being damaged by transient voltages (e.g. on collapse of the magnetic field when a relay is de-energised). This diode will fit any of the standard blade fuse holders or fuse boxes in our range. Needed to add a diode to a wiring harness. This product made it easy with the inline splashproof blade fuse holder. The diode package is slightly taller than a standard blade fuse and so the holder doesn't close fully. This didn't matter for my use but dropped a star.